All countries have contributed to recent climate change, but some much more so than others. Those that have contributed more than their fair share have accumulated a climate debt, owed to countries that have contributed less to historical warming. The U.S. alone carries 40 per cent of the cumulative world debt, while Canada carries about four per cent. On the other side, the carbon creditors — those whose share of CO2 emissions has been smaller than their share of world population — are India, Indonesia, Bangladesh, Pakistan, Nigeria, Brazil and China, with India holding 30 per cent of the total world credit. “Thinking of climate change in terms of debts and credits for individual countries shows how much countries have over- or under-contributed to historical warming, relative to their proportion of the world’s population over time,” explains Matthews, study author and associate professor in Concordia’s Department of Geography, Planning and Environment. To estimate differences in national responsibility for historical climate changes, Matthews first calculated carbon debts and credits based on fossil fuel CO2 emission and population records since 1990. It was around this date that scientific knowledge and public understanding of the dangers of human-driven climate changes began to solidify. 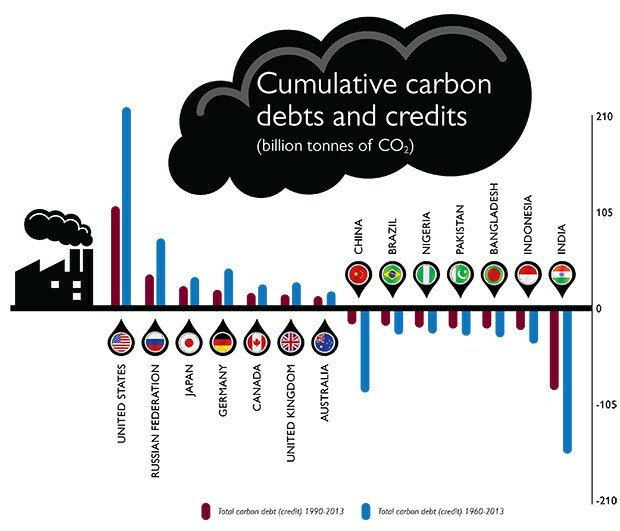 Since that time, the total carbon debt across all debtor nations has increased to 250 billion tonnes of carbon dioxide. And it’s still going up: the increase in world carbon debt in 2013 alone was 13 billion tonnes, or about 35 per cent of global CO2 emissions in that year. Matthews also calculated how much each country has over- or under-contributed to temperature increases as a result of a range of different greenhouse gas emissions. By this measure, the total accumulated world climate debt comes to 0.1°C since 1990, close to a third of observed warming over this period of time. Again the U.S. is the single largest debtor, and India is the largest creditor. Some countries, however, like Brazil and Indonesia, switch from being carbon creditors, to being among the climate debtor countries, as a result of the additional greenhouse gas emissions produced by deforestation and agriculture. What does this mean for the upcoming Paris meetings? Find out more about research in the Department of Geography, Planning and Environment.